Film review of the reboot of the original Australian futuristic action series, now starring Tom Hardy, Charlize Theron and Nicholas Hoult and directed by George Miller. To like this review or to leave comments about it, scroll to the bottom. Producers: George Miller, Doug Mitchell, P.J. Voeten. Writers: George Miller, Brendan McCarthy, Nick Lathouris. Tom Hardy, Charlize Theron, Nicholas Hoult, Hugh Keays-Bearn, Josh Helman, Nathan Jones, Zoe Kravitz, Rosie Huntington-Whiteley. 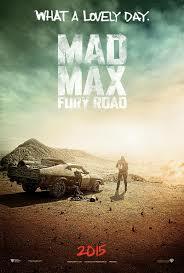 Set in a future desert wasteland where gasoline and water are scarce commodities, Max Rockatansky (Hardy) joins forces with Imperator Furiosa (Theron) to flee from cult leader Immortan Joe (Keays-Byrne) and his army in an armored tanker truck. This leads to a lengthy road battle. Producer/writer/director Miller made a name for himself (and created the megastar who is Mel Gibson in the process) with three visually striking nihilistic action adventures about the former cop Max Rockatansky and his travails through the barren, desert wilderness of a post-apocalyptic Earth. It has now been 30 years since the release of the third instalment of the original series (Beyond Thunderdome, the one which starred Tina Turner) and as Miller himself has recently said, not only has the world changed, but so has cinema, how we enjoy movies and Miller himself. So with this in his mind, Fury Road is thus an eye-popping, digitally fantastic next step forward in crowd-pleasing, adrenaline-laced thrills. Mel Gibson, if he were to have starred, would, like me, have probably needed a lie-down with a cup of tea between each take. For Fury Road certainly lives up to it’s attention grabbing, masculine title, full of energy and pent-up frustration about to explode. Whether this can be linked to the frustrations built up in Miller since abandoning his native Australia to make films in America (The Witches Of Eastwick, with the on-going feuds with his cast or being forced to leave the directors chair of Contact due to creative differences with the studio) one cannot be sure, but his unique, schizoid visual style is allowed full reign here. The whoppingly bigger budget ($150m) is slightly more than the estimated $400,000 used to make the first film and has certainly given Miller the freedom to conjure up some mighty movie mayhem for his audience’s delight. He is also free to create a bigger world and more complex narrative and characters than before; Fury Road definitely fills the vast expanses of its landscapes. The desert storm car-chase is an immense and relentless sequence, a catch your breath after shifting in your seat moment. It sets the pace for the rest of the movie superbly. It is a shame that the film is here on in literally a one situation piece (that situation being an extended car chase), but it hits it’s mark throughout as the chase never lets up. The dollars were also well spent on the fantastical production design and costuming. From the soaring, lush citadel to the men on stilts in the swamp that was Green Land and the geometric shells of the Citadel citizens, this is stunningly realised. The downside is that the film can feel cluttered, especially during the opening sequences at the Citadel with too many layers of people, scenarios, objects, names and colloquialisms. But an over-stuffed and jargony story also suits the in your face, camera slamming into the action style that is Miller’s hallmark. The performances are suitably over-ripe and nihilistic from Hardy right down the cast list. If Hardy manages to be monotone, monosyllabic and mute in equal measure (and sometimes at the same moment), Theron proves that a woman can out man a man as a far more active and tortured hero. Hoult, as the drone who tries to destroy their endeavours but eventually turns good, has fun in what is a spiky support turn. To conclude on a nit-picky note: It could be my interpretation of this sort of futuristic story, but why battle for oil as a means of power in the desert, when harnessing solar energy is the way to go? I know a story-teller may need to make parallels with current political and social issues, but green energy can turn people to the bad and if you can create a high rise Citadel in a post-apocalyptic desert, a few solar cells won’t tax you.